There is no better pairing than good-spirited trash talk and sports. During any given baseball, football or basketball game, the actual competitions happening at any given moment go well beyond the field of play. Indeed, the fiercest of battles are waged between the fans—and those happen to be our favorites. Instead of a sub 4.2 forty, the athleticism of a fan is measured in the written word. Or, for the purposes of this blog, they’re measured by their sharpness of wit as laid out on a large, ideally very visible piece of poster board. Isn’t it the best when you can see these shining beacons of brilliance in the background of an ESPN interview or on College GameDay? Or sometimes they can be found in the parking lot—or even streaking across the field. (FYI, we don’t promote such behavior. But we’ll give it to you, it’s gutsy). 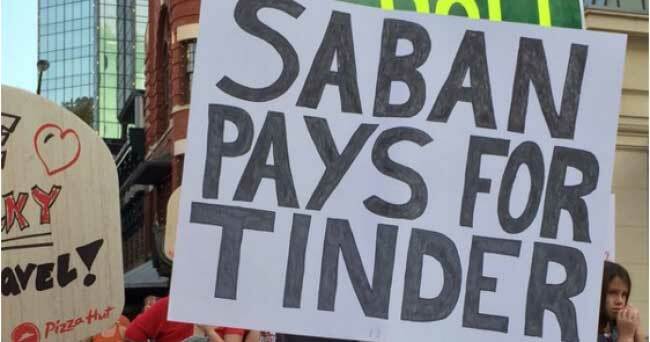 So in the spirit of appreciation of these amazingly funny, witty and often biting placards, we’re running down the list of some of our favorite sign concepts in action. And for good measure, we’re also sharing a few tips we’ve picked up along the way to help you create your own. Alabama. For. The. Win. Alabama fans are in a different category, for sure. They just crush it whether they are on the field or in the stands. And nothing says “burn” like a genius concoction of professional football, college football, star quarterbacks and lawsuits. This is a dig of epic proportions indeed. For all it’s got going on, we call this poster tactic The Multitasker. The Classic Irish Burn There’s no crying in baseball. And you know what? There isn’t any in football either—with one exception if you ask this Tigers fan. And that’s the Irish. (The school, not the people who originate from the country of). This represents an excellent use of weaving weather conditions into a Division 1 A dig. Better keep those golden helmets on for that one. We call this one The Rainmaker. This is a classic example of the nouveau-millennial sign. It likely will whizz right over the heads of Hungry Fans who still remember watching Bo Jackson crush it at two professional sports, so we’ll break it down for you. Nowadays, Tinder is pretty much the lowest rung of the dating app ladder. Or in other words, it’s a late-night-swipe kind of app. So paying for the premium version of Tinder would essentially brand someone a big creep—and doubly-so if this person is already a known quantity (aka a famous person). We call this one The Savant. Like a flea-flicker on the first play of the game, some of the wittiest sign makers play the long game in an effort to thoroughly confuse their opponents. 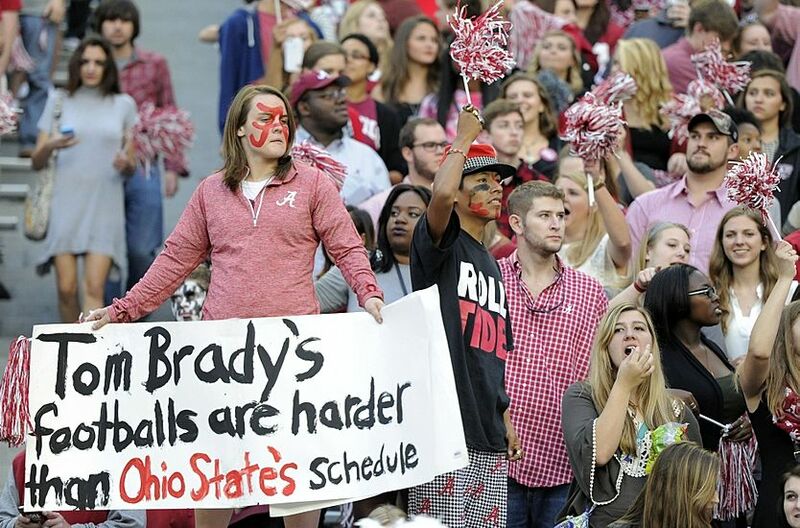 This sign comes straight out of Harvard, so we’re just assuming it is a genius dig at someone on the opposing team. We really have no idea so we’ll call this one The Touché. Sometimes you want your sign to absolutely obliterate the confidence of the opposing team. Other times, you just want to have a funny sign that people will point at and laugh. “I just hope both teams have fun” will definitely have people rolling, except maybe during bowl games and Rivalry Weekend. That’s when you decidedly will not get love from friend or foe. We call this one The Peacemaker. For all of you out there that have tailgated outside of Comic Con, you must agree that the adversary of the University of Iowa who crafted the sign above is half-man, half fan, with a sprinkling of geeky-genius. Most kids fall in love with sports and comic books at the same time, so the reference within the sign was built for multi-generational appeal. Way better than The Savant Sign, we’ll call this one The Stan Lee. We happily admit that this sign gave us a case of the chuckles. The ones that last for a bit. (Actually still chuckling while writing this fan sign review). 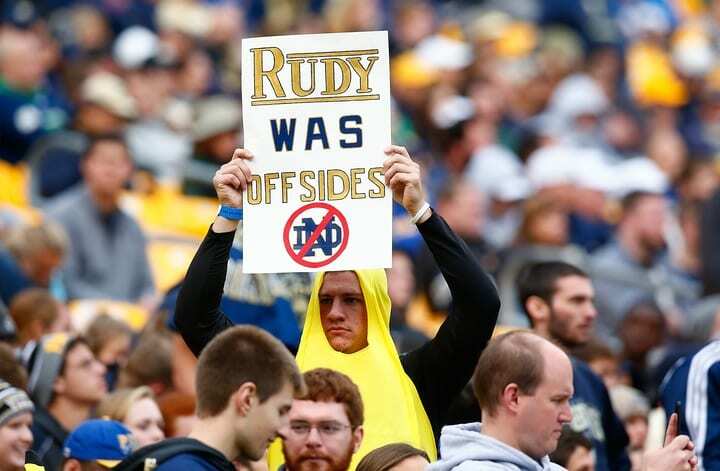 You’ve got to hand it to him; the fan holding this sign really went for it with the full banana costume and the gruesome deadpan stare. Good for him, and again, too bad for Notre Dame. We call this one The Movie Buff. 👉 We will be making this an ongoing series and we want to see what YOU can come up with. Send us your favorite game day sign pics via DM on Instagram or email us at hello@hungryfan.com.